Offering stability and confidence to every single one of your residents, our Walking Frame is a practical addition to care and residential homes. It boasts a selection of additional features designed to offer practicality and reliable service. Alongside the durable powder coated frame for inclement weather, this frame is height adjustable for versatility and can be adjusted up to 10cm at a given time. It wraps around the user's body to provide support from all angles and is finished with soft, contoured foam grips to minimise hand strain. 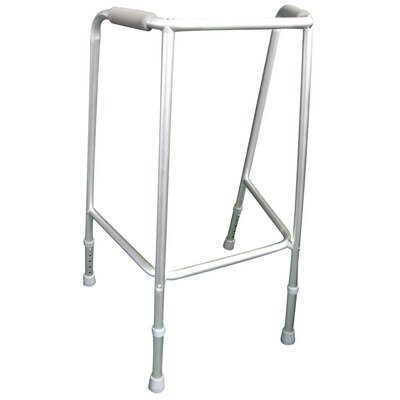 Provided at an economical price, this walking frame is an item that will quickly become essential to your everyday lives. Here at Gompels, we have a wide range of products designed to support healthcare providers. From our sturdy Wheelchairs through to supportive Commodes and other Bathroom Equipment, you'll find exceptional prices showcased together in our Care Home Equipment category.